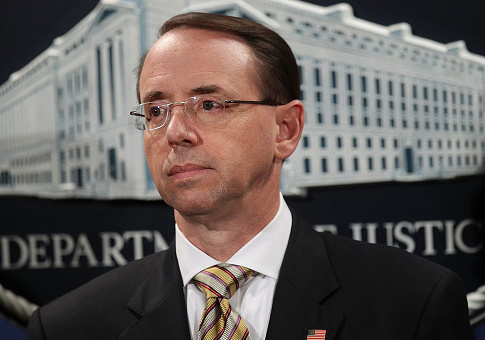 Deputy Attorney General Rod Rosenstein announced indictments of two Chinese nationals and their North American counterparts on Tuesday, charging them with conspiracy to distribute fentanyl and fentanyl analogs in the United States. Xiaobing Yan, 40, and Jian Zhang, 38, were indicted in the Southern District of Mississippi and District of North Dakota, respectively, for their operation of drug rings that distributed fentanyl and other opioids to drug distributors and individual users in the United States. Both men advertised directly to Americans, who purchased their drugs over the so-called "dark web." The two are the first Chinese nationals designated as Consolidated Priority Organization Targets (CPOTs), defined as "‘command and control' elements of the most prolific international drug trafficking and money laundering organizations." "CPOTs are among the most significant drug trafficking threats in the world. The defendants allegedly shipped massive quantities of deadly fentanyl and other synthetic opioids to communities throughout the United States, mostly purchased on the Internet and sent through the mail. The chemicals allegedly killed and injured people in several states, and surely caused misery to many thousands of people," Rosenstein said. Yan was indicted following an investigation that began in Mississippi in 2013, where a traffic stop led to the discovery of a domestic drug ring selling synthetic cannabinoids. During the subsequent investigation, Yan was found to be distributing acetyl fentanyl and other fentanyl products to U.S. customers over the internet, as well as operating at least two chemical plants in China able to produce tons of fentanyl. If convicted, he faces a maximum penalty of 20 years in prison and a $1 million fine. Zhang was found to have been selling fentanyl, also over the internet, which eventually led to the 2015 overdose death of an 18 year old in Grand Forks, North Dakota. Authorities traced Zhang through Oregon and Canada to China, where he ran an organization manufacturing fentanyl in at least four known labs, the Justice Department alleged. If convicted, Zhang faces up to life in prison and a $12.5 million fine. The investigations into both Yan and Zhang revealed an international flow of drugs between the United States, China, and Canada, where fentanyl and other opioids are smuggled into the United States for sale to U.S. consumers. Rosenstein thanked the Royal Canadian Mounted Police for their work on the cases, and spoke highly of collaborative efforts between U.S. law enforcement and their Chinese counterparts. Although the indictments have been issued, Rosenstein would not comment as to whether or not Yan and Zhang are currently in custody. The United States has no extradition treaty with China, and Rosenstein would also not comment as to whether or not he expected the Chinese government to extradite the pair. Opioids, and fentanyl especially, are responsible for a plurality of the rapidly increasing number of drug overdose deaths in the United States, Rosenstein said. The CDC found preliminarily some 64,000 drug overdoses in 2016, with 20,000 attributable to fentanyl and another combined 29,000 attributable to heroin and prescription opioids combined. "At a time when overdose deaths are at catastrophic levels, let me be clear: DEA’s top priority—not one of them, top priority—is addressing opioids and pursuing the criminal organizations distributing their poison to American neighborhoods," said acting DEA Administrator Robert W. Patterson, who joined Rosenstein at the press conference. President Donald Trump announced on Monday that he would designate the opioid crisis a national emergency, a declaration he previously pledged to make in August, and a move supported by, among others, the President’s Commission on Combating Drug Addiction and the Opioid Crisis. Additionally, Rosenstein was asked at the press conference about reports over the weekend that tied Rep. Tom Marino (R., Penn. ), Trump's drug czar nominee, to legislation that helped curb DEA oversight of legal opioid distributors. Marino withdrew his name from consideration in the wake of the report. Rosenstein said that his office was still reviewing the relevant legislation, but said that he was "very concerned" about the story. This entry was posted in Issues and tagged Department of Justice, Opioids, Rod Rosenstein. Bookmark the permalink.